This week we are going to deal with an inevitable topic. Use of plant coupling and rotation of crops helps us maintain the health of vegetables, and thus provide fresh produce throughout the whole vegetation period. This article is based on experience from Krishna Valley and research into specialized literature. The whole text is derived from our book entitled Discussions on Self-sufficiency. When speaking of diversified gardening maintaining the soil’s health and welfare of plants, as well as enhancing productivity and preventing the escalation of diseases can be best achieved by using plant coupling and rotating of crops. When planning the rotation we take into account the succession of plants, and when designing conscious plant coupling we take into consideration their adjacency. It is an ancient observation that most of the plant species are not indifferent to each other. There is a whole system of complex network of sympathy and antipathy among them. Naturally, these relations do not function on emotional level, but rather exist because of biochemical, physiological reasons and manifest through the metabolism of species. One of the plants prepares perfectly the soil for the other, the third one frightens off the fourth’s pests, furthermore, next to the fifth one the sixth grows hardly at all, does not shoot flowers or bear crop. If we take into consideration all these relations, then we save ourselves from a lot of trouble and our gardening work will be much more prolific and fruitful. The most well known couplings: carrot – onion (they protect each other from carrot rust fly and onion maggot); celery – plants of cabbage family (they protect each other from celery blight as well as cabbage-butterfly); salad – radish (salad protects radish from vine-beetle); cabbage – tomato (tomato frightens off cabbage-butterflies); potato – green bean (green bean scares away Colorado beetle); cucumber – onion (onion hinders the spreading of mildew). Other favourable couplings: bean – plants of cabbage family; beetroot – plants of cabbage family; tomato- parsley; tomato – onion; tomato – celery, tomato – dwarf bean; parsnip – onion; salad – bean; salad – cucumber; salad – dwarf bean; salad – beetroot; salad – Swiss chard; pea – plants of cabbage family; cucumber – plants of cabbage family; potato – pea; potato – bread-bean. 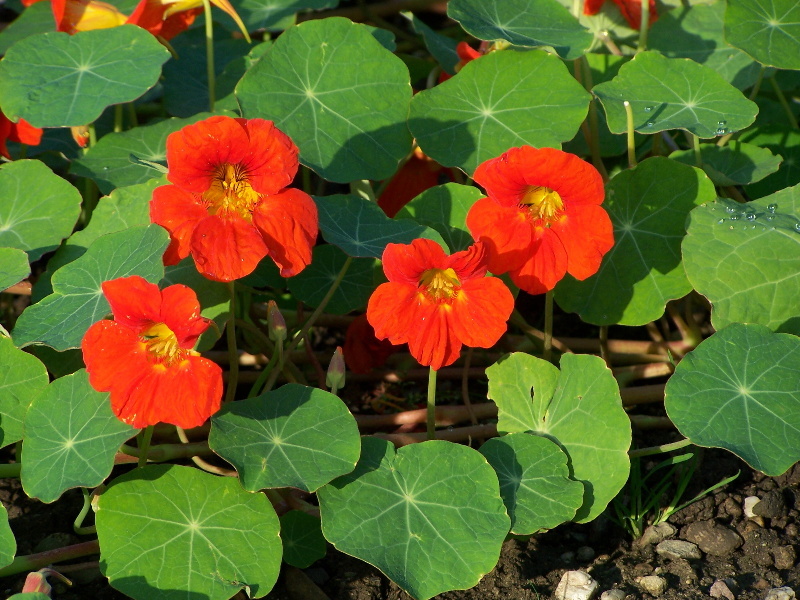 Tropaeolum, tomato, celery, basil (and other plants containing essential oils, like tagetes, wild marjoram (oregano), sage, pepper-grass, marjoram) are all so-called repellents, as they keep away pests from plants. With the exception of unwanted adjacency these may be used effectively everywhere in coupling. Parsnip is quite an extraordinary vegetable, because it is resistant to all kinds of pests. Here is a list on the most unwanted couplings: bean – onion, potato – onion, red cabbage – tomato, carrot – tomato, parsley – lettuce, paprika – aubergine, squash – potato. If we always take into account these so-called antipathetic relations, then we cannot make huge mistakes. Group A. – Main vegetables that are going to be present in the vegetable garden from May until the end of growing period, therefore, only vegetables with short growing period can precede them. Species: tomato (p), runner bean (l), cucumber (cu), late-cabbage (br), potato (p), pumpkin (cu), zucchini (cu). Group B. – These are vegetables that are present in the first or second period of growing period. Species: cauliflower (br), celery (ap), dwarf bean (l), early-cabbage (br), beetroot (ch), pea (l), parsnip (ap), onion (li), black salsify (as). Group C. – Vegetables with short growing period. These may change come after each other continuously; we can even grow different varieties (early, summer, late) of the same species. Species: early potato (p), salads (as), early, mid-early and late carrot (ap), kohlrabi (br), radish (br), sweet fennel (ap). *Abbreviation of family names: (p) – potato, (ap) – apiales, (as) – asterales, (l) – legumes, (br) – brassicaceae or cabbage family, (ch) – chenopodium, (li) – liliaceae, (cu) – cucurbitaceae. When planning the arrangement of the vegetable garden it is recommended to plant vegetables of A, B, and C group respectively, so that they come after each other by turns. The distance between rows may vary between 40 and 50 cm. A classic pattern is A, C, B, C, A… and so on and so forth. This means that there is about 2 meters between two A rows that is filled in with one B, and two C rows. In rows A plants of group A will be the dominant vegetables, but preceding that we may choose green crops for the same row from group C with short growing period. In B rows we may choose vegetables from group B or C that precede the main vegetables of group B. In rows C short growing period plants from group C come after one another successively. This system might seem a bit complicated (because we have to take into account a lot of aspects), however, once we have made a plan in accordance with our needs, then we may use that every year with some slight alterations only. Within rows we may alter vegetables according to the above-mentioned favourable and unfavourable couplings. 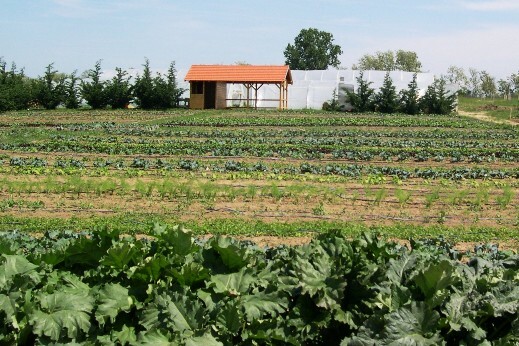 Crop rotation is realized in such a way that we move the rows one row further annually. It is a general principle that vegetable that goes into the same family (see abbreviation on family names above) should not be planted on the same place within 3 years. If we keep to crop rotation and we mulch and use compost in between rows, then in a few years time will have a perfect organic garden. Wow! I want to learn how to do that plant coupling! I think it is more interesting when i do that in real life. I am looking forward now what will happen if i am gonna do that. Thanks for sharing!